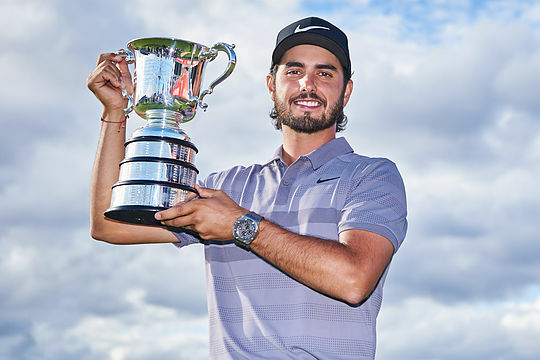 Abraham Ancer has run away with the Australian Open firing a final round 3-under 69 to finish at 16-under for a five stroke win at The Lakes Golf Club in Sydney. The victory was on the back of rounds of 69-69-65-69 and will see the Mexican with a start at the 2019 Open Championship and a move inside the world’s top-60. Ancer began the final round with a commanding five-shot lead and cruised to his second professional title after winning the 2015 Nova Scotia Open on the Web.com Tour. Sunday’s win is certainly his biggest to date following a number of top-5 finishes on the 2018-19 PGA Tour during the early season. “It was windy all week and I grew up playing in the wind, so I felt at home out there,” said the 27-year-old Ancer. Dimi Papadatos was runner-up after an impressive final round 67 and made the most of having Tony O’Rourke, a member and former Captain of The Lakes, on his bag. Papadatos has a conditional card on the European Tour but today’s result sees him move up the Australasian Order of Merit and another good finish at the Australian PGA in a fortnight could see him take out the top position and the benefits that go along with that ranking. Jake McLeod, last week’s winner of the NSW Open, was in third position at 10-under-par with Marcus Fraser in fourth position. McLeod had at one point been leading the championship until being penalised a stroke for waiting too long for what he thought was a birdie putt to drop on the fourth hole of the third round. The top-5 was rounded out with amateur David Micheluzzi, Matthew Millar, Japanese amateur Keita Nakajima, Cameron Percy and John Senden all sharing 5th position. The winning margin was the biggest for an Open at The Lakes and the biggest at any Australian Open since Jordan Spieth won the trophy for the first time at The Australian four years ago. Both McLeod and Papadatos join Ancer in earning a start in next year’s British Open at Royal Portrush in Northern Ireland with their top-three finishes. Tournament drawcords, Keegan Bradley and Matt Kuchar were unable to get their games in tune with final-round 75s to finish at four and three under respectively.